Helps support bones and muscle function. 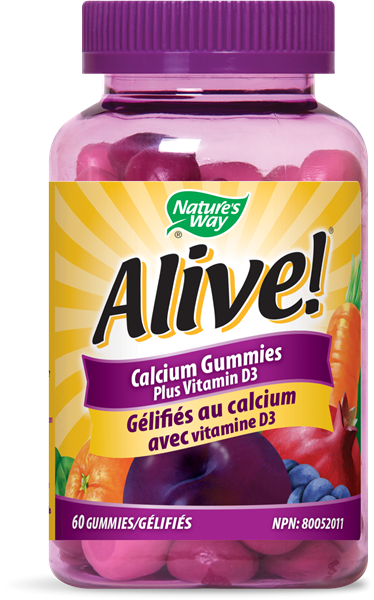 Adults take 2 gummies per day. Take a few hours before or after taking other medications. Recommended use: Adequate calcium and vitamin D throughout life, as part of a healthy diet, along with physical activity, may help prevent bone loss/osteoporosis in peri-and post-menopausal women in later life. 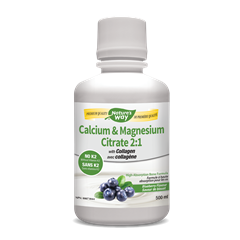 Helps in the absorption and use of calcium and phosphorus. Helps the body metabolize carbohydrates, fats and proteins. tapioca syrup, cane sugar, pectin, fruit and vegetable blend (orange, blueberry, carrot, pomegranate, prune, strawberry, pear, apple, beet, raspberry, cherry, pineapple, pumpkin, cauliflower, grape, açaí, asparagus, banana, broccoli, brussels sprout, cabbage, cranberry, cucumber, pea, spinach, tomato), citric acid, colour (black carrot juice concentrate), cherry flavour, strawberry flavour, fractionated coconut oil, beeswax, silica.